The twelfth episode of the Catalyst and Witness podcast, devoted to exploring the films and format of the New York Film Festival, hosted by Ryan Swen and Dan Molloy. 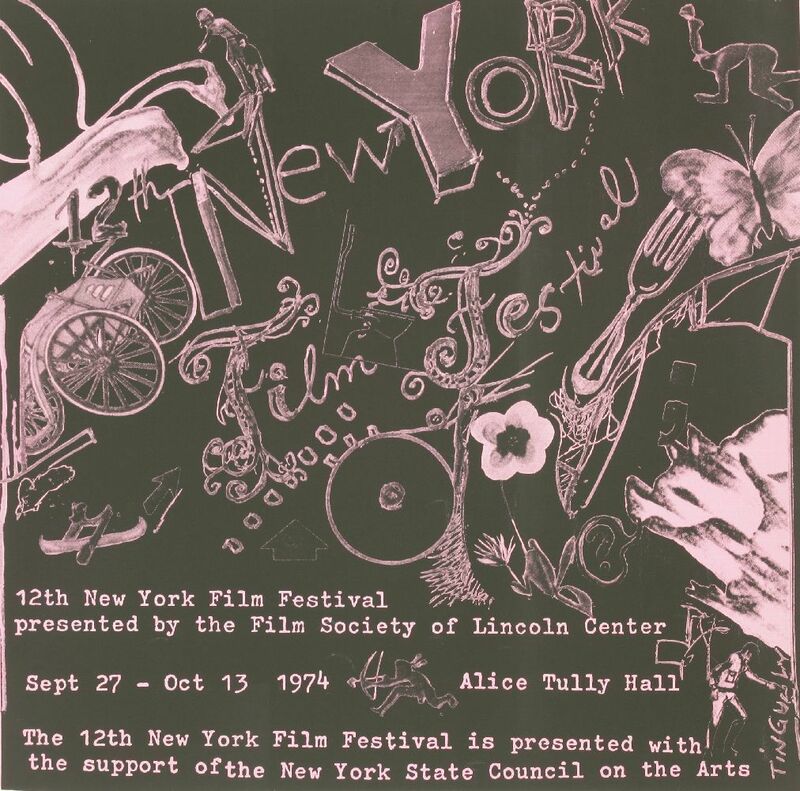 This covers the twelfth edition of the festival in 1974, and features special guest Jason Miller, New York cinephile and kind of a Twitter guy. Kristen Yoonsoo Kim’s name was misspoken as Kristen Soonyoo Kim. Pascal Thomas, Pleure pas la bouche pleine!, 1973, 35 mm, color, mono sound, 116 minutes, 1.66:1, French, France. Max Ophuls, Liebelei, 1933, 35 mm, black-and-white, mono sound, 88 minutes, 1.20:1, German, Germany. Sérgio Ricardo, A Noite do Espantalho, 1974, 35 mm, color, mono sound, 92 minutes, 1.37:1, Portuguese, Brazil. Louis Malle, Lacombe Lucien, 1974, 35 mm, color, mono sound, 138 minutes, 1.66:1, French, France. Alain Resnais, Stavisky…, 1974, 35 mm, color, mono sound, 120 minutes, 1.66:1, French, France. Robert Bresson, Lancelot du Lac, 1974, 35 mm, color, mono sound, 85 minutes, 1.66:1, French, France. Alexander Kluge, Gelegenheitsarbeit einer Sklavin, 1973, 35 mm, black-and-white, mono sound, 91 minutes, 1.37:1, German, West Germany. Claude Chabrol, Le banc de la désolation, 1974, 35 mm, color, mono sound, 52 minutes, 1.37:1, French, France. Miklós Jancsó, Rome rivuole Cesare, 1974, 35 mm, color, mono sound, 78 minutes, 1.37:1, Italian, Italy. Mirra Bank, Yudie, 1974, 16 mm, color, mono sound, 20 minutes, 1.37:1, English, USA. Martha Coolidge, Old-Fashioned Woman, 1974, 16 mm, color, mono sound, 49 minutes, 1.37:1, English, USA. William Greaves, From These Roots, 1974, 16 mm, black-and-white, mono sound, 31 minutes, 1.37:1, English, USA. Martin Scorsese, Italianamerican, 1974, 16 mm, color, mono sound, 49 minutes, 1.37:1, English, USA. Jack Hazan, A Bigger Splash, 1973, 35 mm, color, mono sound, 106 minutes, 1.66:1, English, UK. Jacques Rivette, Out 1: Spectre, 1972, 16 mm, color, mono sound, 253 minutes, 1.37:1, French, France. Alain Tanner, Le Milieu du monde, 1974, 35 mm, color, mono sound, 115 minutes, 1.37:1, French, Switzerland. Rainer Werner Fassbinder, Angst essen Seele auf, 1974, 35 mm, color, mono sound, 92 minutes, 1.37:1, German, West Germany. Jean-Pierre Melville, Les Enfants Terribles, 1950, 35 mm, black-and-white, mono sound, 105 minutes, 1.37:1, French, France. Jacques Rivette, Céline et Julie vont en bateau, 1974, 16 mm, color, mono sound, 193 minutes, 1.37:1, French, France. Wim Wenders, Alice in den Städten, 1974, 16 mm, black-and-white, mono sound, 110 minutes, 1.66:1, German, West Germany. 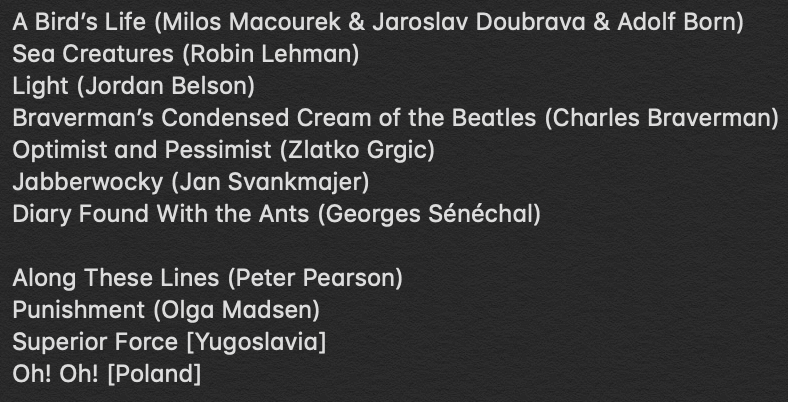 Daniel Schmid, La Paloma, 1974, 35 mm, color, mono sound, 110 minutes, 1.37:1, German, Switzerland. Ermanno Olmi, La Circostanza, 1973, 35 mm, color, mono sound, 97 minutes, 1.37:1, Italian, Italy. Luis Buñuel, La Voie lactée, 1969, 35 mm, color, mono sound, 102 minutes, 1.66:1, French, France. Luis Buñuel, Le Charme discret de la bourgeoisie, 1972, 35 mm, color, mono sound, 102 minutes, 1.66:1, French, France. John Cassavetes, A Woman Under the Influence, 1974, 35 mm, color, mono sound, 155 minutes, 1.85:1, English, USA. Luis Buñuel, Le Fantôme de la liberté, 1974, 35 mm, color, mono sound, 104 minutes, 1.66:1, French, France. Perhaps the most elegant metaphor for cinema ever devised, and crucially Céline and Julie Go Boating lacks a *visible* camera (which would localize its aesthetic concerns too thoroughly); Rivette’s supreme intelligence is such that theater and cinema, to an even greater extent than in his past films, mesh through his deftness of both staging and editing, as each new shot choice or repetition creates its own associations. Plus, what image of a moviegoer is more relatable than the two women staring slack-jawed at the screen, occasionally giggling or gasping in disbelief? Impossible to state how much the inclusion of the ship denied harbor by the effect of the rising soy prices does to establish the world in which Blackhat moves: it is one set by nebulous rules and regulations, where the fate of innumerable people can be turned by the whims of a ghost in the machine. Only a ghost can kill another ghost.